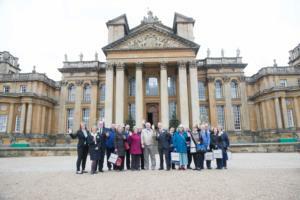 To celebrate the launch of their summer 2018 Door to Door Holiday brochure, Johnsons Coach Travel took 400 clients, to the awe-inspiring Blenheim Palace for the day. The event gave Johnsons an opportunity to meet their customers face to face and treat them to a fantastic day out at this stunning palace, with its Baroque architecture, landscaped parkland and stunning formal gardens. Johnsons’ Summer 2018 brochure is out now and packed with over 200 departures between April and October 2018 including 40 NEW tours or itineraries including new luxury tours, active traveller holidays, holidays to Scotland, Ireland, Europe and a 27 day escorted ‘once-in-a-lifetime’ tour of New Zealand. Clients were split into two groups to present the programme, and were welcomed to the Blenheim Palace with coffee and biscuits and had the chance to chat to Johnsons’ hoteliers who included Brend Hotels, Maritim Hotels, Q Hotels, Best Western Hotels, Marriott Hotels, HF Holidays, Silverfern, Travelsmith, Warner Leisure Hotels, Travelsphere, Thwaites, and Norman Allen. Then John Johnson and Wendy Moore presented the new programme with a trivia quiz, which kept everyone entertained, whilst also telling clients about the fantastic holiday destinations and attractions to visit in 2018, with prizes too! There was also a charity raffle, in aid Johnsons’ Charity of the year, Acorns Children’s Hospice - and a total of £650 was raised. Clients were then free to explore the palace and wander through the various grand state rooms to see the giant oil paintings, tapestries, statues, priceless china and elaborate gilt frames. Blenheim was the birthplace of Winston Churchill, and there is a Churchill Exhibition dedicated to the life, work, paintings and writings of the prime minister.